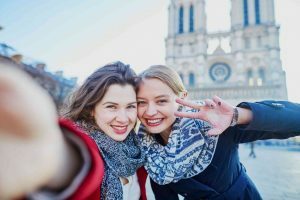 It isn’t uncommon to spot swarms of picture-taking tourists standing outside of the Notre Dame on any given day in Paris. As one of the most well-known churches is the world, The Notre Dame is considered to be one of the finest examples of French Gothic architecture known to man. The building has seen desecration, revolution, and restoration since its erection in 1345 and continues to stand as a beacon of beauty for Parisians and travelers everywhere. You’ve seen the photographs and very well have even walked its splendid halls, but do you there are many legends lurking in the Notre Dame’s high ceilings and cavernous rooms? The Notre Dame is filled with masterful examples of architecture and pieces of art. One of the most interesting statues features 2 angels positioned opposite of a man standing erect, holding his own head in his hands at the waist. It pays homage to the story of Saint Denis, a man caught in 250 A.D. preaching Christianity. He was sentenced to death, but the lazy executioners could not make it to the top of the hill in the midday heat. They chose to perform the beheading on the side of the hill and cried in fear when Saint Denis’ decapitated body stood from the ground, picked his head from the dirt, and proceeded to walk back into town. Many spend their entire life looking for the secret to eternal youth. Legend says that the Notre Dame can lead you to it. Hidden messages are thought to have been embedded in the facade which acts as a map leading to the Fountain of Youth! Treasure hunters and decoders have stood at the church for years, attempting to solve the mystery. Is it a Sign or an Invoice? Locals artisans wanted to ensure that they were paid for their contributions to the creation of the Notre Dame. PayPal had yet to be invented, so each stonemason created a personal insignia that was pounded into every block that he sized. Although most of these signs have faded throughout the centuries, you may be able to spot one if you know where to look. Experience the Cathédrale Notre-Dame de Paris with AESU! This entry was posted on Wednesday, January 18th, 2017	at 12:41 pm	. You can follow any responses to this entry through the RSS 2.0	feed. Both comments and pings are currently closed.